Historical and hydrographical chart. 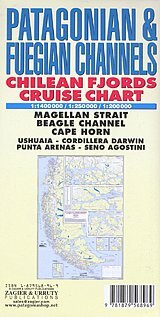 Cruise log for the intricate coast of the south of South America. Insets of Beagle Channel "Glaciers Avenue", Agostini Fjord, Wulaia Inlet and Romanche Bay. All on one side, 1:1,400,000 overview map, and detailed maps at 1:250,000 and 1:200,000 scale. Printed on tough water and tear resistant material.